PARIS, France - May 27, 2009 - Cisco today announced that Free (Iliad Group), a leading triple-play over broadband operator in Europe, is continuing to expand its Cisco® Internet Protocol Next-Generation Network (IP NGN) infrastructure to increase its capacity for future subscriber demand and to deliver higher bandwidths to existing users. At the end of March 2009, Iliad Group had more than 4.3 million broadband subscribers. Following a 1 billion euro investment plan to bring fibre-to-the-home (FTTH) to 4 million households by the end of 2012, Free is expanding its national footprint with additional Cisco CRS-1 Carrier Routing System deployments in Lyon, Strasbourg and Bordeaux, interconnected by a high-performance converged IP/optical network. These investments will help enable Free to offer its innovative portfolio of rich-media entertainment and communications services to subscribers throughout France. Maxime Lombardini, chief executive officer of Iliad (Free) said: "Cisco CRS-1 systems have played a vital role in our network since 2006 and Cisco's innovations on the CRS-1 platform have allowed us to continually meet and exceed our vision for delivering the very best broadband services in Europe. We are building the network of the future, and we want everyone to enjoy the rich experience that this offers. With this latest network expansion, we can offer an improved experience to current subscribers who are increasingly using video, social networking and collaboration applications, and establish the foundation to achieve our 5 million subscriber target by 2011." Free is converging its dense wavelength-division multiplexing (DWDM) optical network onto a completely IP-based infrastructure by installing Cisco 10 Gigabit Ethernet IP over DWDM (IPoDWDM) line cards in all Cisco CRS-1 systems throughout its network. By using Cisco IPoDWDM technology, Free eliminates the need for optical-electrical-optical (OEO) conversions in the network, reducing visits to its Points of Presence (PoPs) to provision new services and streamlining the management of the complete network via a single interface. All these developments will allow Free to roll out new services across its network with ease, while lowering its overall operating expenses. "Service providers around the world are under increasing pressure to deliver more and more from their networks, both in the capacity to deliver more services and in the flexibility of rolling out these services quickly. A unified infrastructure based on integrated IP and optical technology is vital, as it helps the service provider to create a very competitive cost base, while simplifying operations and improving service velocity," said Laurent Blanchard, managing director of Cisco France and vice president for Cisco Europe. "Free's continued success and growth is a prime example of how the capabilities of the Cisco CRS-1 and a converged IPoDWDM network can be used to deliver the next-generation services that consumers demand." 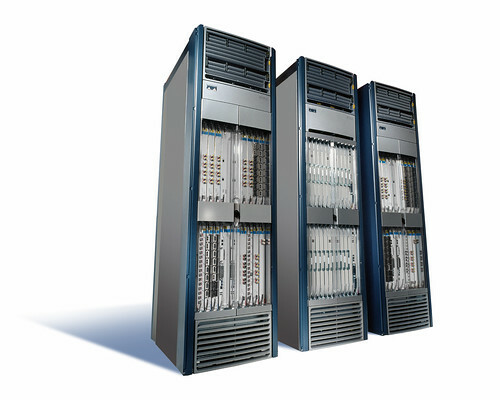 The Cisco CRS-1 platform was introduced in May 2004 as a new class of carrier routing system designed to deliver continuous system operation, service flexibility and extended system longevity to service providers, with more efficient space and power consumption than comparable routers. The Cisco CRS-1 was the first router to scale to more than 90 terabits per second of bandwidth capacity, helping service providers to deliver superior customer experience as IP traffic exploded with the advent of broadband video. Since its launch, CRS-1 innovations have added new features such as integrated IPoDWDM transponders, secure domain routing and 100 Gigibit Ethernet support. To date, more than 3,200 CRS-1 systems have been shipped to over 300 customers around the world. Free is an Iliad subsidiary. The Iliad Group is a major player in the French Internet access and telecommunications market via Free and Alice (4,337,000 ADSL subscribers as of 31 March 2009), Onetel and Iliad Télécom (fixed telephony providers) and IFW (Wimax). The Iliad Group is listed on Euronext Paris under the ticker ILD.